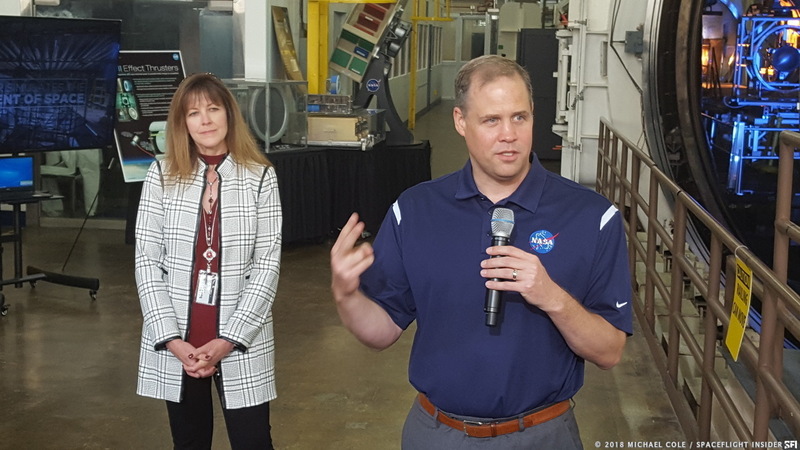 CLEVELAND, Ohio — NASA Administrator Jim Bridenstine paid a visit to the space agency’s Glenn Research Center earlier this week, as well as its associated testing facility, Plum Brook Station in nearby Sandusky. Bridenstine toured the many facilities and laboratories of Glenn and Plum Brook and met with numerous scientists, engineers and managers in a two-day visit that gave the new Administrator his first look at some of the technologies under development for the new space directives set forth by the Trump Administration. Technologies being developed at NASA Glenn that Bridenstine singled out include the Kilopower project, a small nuclear reactor being developed for use as a power generation source for use on the surface of the Moon and Mars. 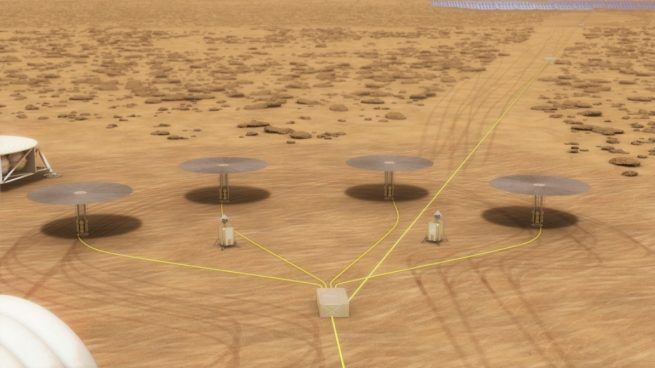 This system of affordable fission nuclear power could enable long-duration stays on the Moon or planetary surfaces where power for in situ resource utilization would be essential to the life and work of the astronauts there. Solar electric propulsion system technologies under development at NASA Glenn is also expected to be critical for the proposed orbiting Lunar Gateway, a space station in high lunar orbit. The Gateway’s first module is currently planned to launch in 2022. Bridenstine took time to address the media and answer questions as he toured NASA Glenn’s solar electric propulsion laboratory. He touched on a number of topics. A recent controversy occurred with the discovery of a small leak aboard a Russian Soyuz module docked to the International Space Station. 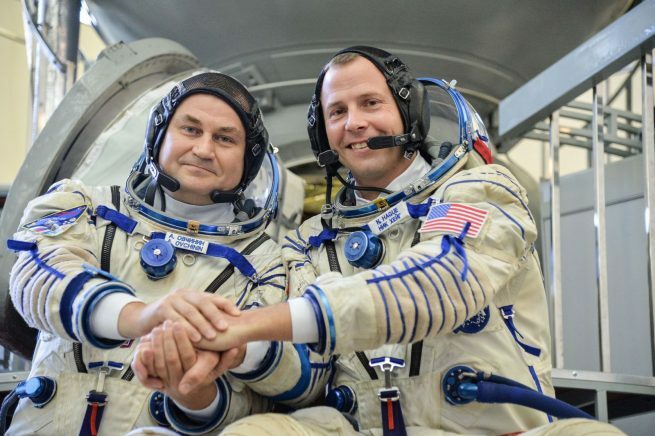 In light of this, Bridenstine was asked to comment about his upcoming visit in October to Russia and Kazakhstan to meet with his Roscosmos counterpart Dmitry Rogozin at Baikonur Cosmodrome to view the launch of Soyuz MS-10. Bridenstine said Roscosmos and NASA has had a long history of partnership and his goal on the October trip is to reinforce the notion of that partnership to Russia. He also wants to assess how much they want that partnership and to keep space exploration separate from the ongoing “terrestrial challenges” that the United States and Russia may have. Bridenstine also addressed the current state of the commercial space industry. He said he wants NASA to be “one customer of many” in order to drive down the cost of access to space so that the space agency can “buy on margin” instead of owning and operating its own systems all of the time. Following his visit of Plum Brook Station on Tuesday, Bridenstine toured NASA Glenn’s visitor center at the Great Lakes Science Center in downtown Cleveland. Afterward, he attended NASA Glenn’s annual Evening With The Stars awards reception at the nearby Rock-n-Roll Hall of Fame. Wednesday was spent at the main campus of NASA Glenn. The center has more than 3,400 workers. President Trump has proposed a budget of $712 million for the facility for the fiscal year 2019.